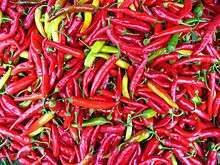 The cayenne pepper, also known as the Guinea spice, cow-horn pepper, red hot chili pepper, aleva, bird pepper,' or, especially in its powdered form, red pepper, is a cultivar of Capsicum annuum, which is related to bell peppers, jalapeños, paprika, and others. The Capsicum genus is in the nightshade family (Solanaceae). It is a hot chili pepper used to flavor dishes and named for the city of Cayenne in French Guiana. Most cultivated varieties of cayenne, Capsicum annuum, can be grown in a variety of locations including tropical and temperate zones and need around 100 days to mature. Peppers prefer warm, moist, nutrient-rich soil in a warm climate. The plants grow to about 0.5–1 m (20–39 in) in height and should be spaced 1 m (3 ft) apart. In gardens, the plants may be planted as close as 30 cm (1 ft) apart in a raised bed, or simply grown in large pots. This may reduce the yield of an individual plant, but will increase yields per unit area. Cayenne pepper, by weight, is high in vitamin A. It also contains vitamin B6, vitamin E, vitamin C, riboflavin, potassium, and manganese. However, given the very small amount of cayenne pepper typically consumed in a serving, it makes a negligible contribution to overall dietary intake of these nutrients. Cayenne pepper is also claimed to be an aphrodisiac because it contains capsaicin. It has also been shown to aid in the oxidation of adipose tissue, regulate high blood pressure, promote healthy liver function and tissue production, help regulate the digestive system, and promote healthy mucus production in the membranes that line internal organs . Beverage foods are emerging with cayenne extract as an active ingredient. One example is Bonavitas cayenne pepper energy drinks. 1 2 Culpeper, Nicholas (1814) . "Guinea Pepper". Culpeper's Complete Herbal. David Hand (Web publication). Retrieved 13 July 2011. ↑ Therapeutic Research Faculty (2009). "Capiscum". Natural Medicines Comprehensive Database (Consumer Version). WebMD. Retrieved 13 July 2011. 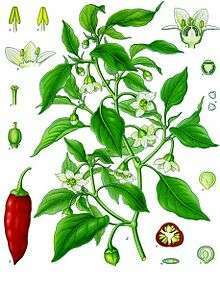 ↑ The pepper from Guinea is Aframomum melegueta, "Malagueta pepper". ↑ Brown, Ellen (27 April 2006). "Growing: Cayenne". ThriftyFun.com. Retrieved 13 July 2011. ↑ South Devon Chilli Farm (2010). "Chilli Seed Propagation and Plant Care". South Devon Chilli Farm. Retrieved 13 July 2011. ↑ "Nutrition Facts: Spices, pepper, red or cayenne". Nutrition Data. Condé Nast Digital. 2011. Retrieved 13 July 2011. ↑ Westerterp-Plantenga, MS; Reinbach, HC; Smeets, A; Martinussen, T; Møller, P (June 2009). "Effects of capsaicin, green tea and CH-19 sweet pepper on appetite and energy intake in humans in negative and positive energy balance.". Clinical Nutrition. 28 (3). ↑ Diepvens, K; Westerterp K; Westerterp-Plantenga M. "Obesity and thermogenesis related to the consumption of caffeine, ephedrine, capsaicin, and green tea". The American Journal of Psychology. 292: 77–85. ↑ Lejeune, M; Kovacs E; Westerterp-Plantegna M (2003). "Effect of capsaicin on substrate oxidation and weight maintenance after modest body-weight loss in human subjects". British Journal of Nutrition. 90: 651–659. doi:10.1079/bjn2003938. ↑ Takahashi, M; Snitker, S; Fujishima, Y; Shen, H; Ott, S; Pi-Sunyer, X; Furuhata, Y; Sato, H (Jan 2009). "Effects Of Novel Capsinoid Treatment On Fatness And Energy Metabolism In Humans: Possible Pharmacogenetic Implications.". American Journal of Clinical Nutrition. 1. 89. ↑ Latif, Ray (30 May 2011). "Extreme and Edgy Flavors". Beverage Spectrum Magazine. Bevnet. Retrieved 13 July 2011. ↑ Stanton Lee, Kendra (March 2011). "Slimming Prospects". Beverage Spectrum Magazine. Bevnet. Retrieved 13 July 2011. ↑ "Bonavitas Cayenne Pepper Energy Drink". PRWeb (USA). 30 June 2011. Nutrient Data Laboratory; et al. "99369: Peppers, cayenne, raw (Capsicum annuum)". USDA Database for the Flavonoid Content of Selected Foods (PDF) (2.1 ed.). p. 68 (PDF p. 3). Retrieved 13 July 2011. Wikisource has the text of the 1911 Encyclopædia Britannica article Cayenne Pepper.